The Garrard Model 74M is a transcription quality record playing unit with the ability to play records automatically when required. It will automatically play 12in (300mm), 10in (250mm) and 7in (174mm) records single or a stack of up to six 12in records at any of three speeds - 78, 45 or 333 rev/min. For playing 78 rev/min records a 3 mill stylus is recommended. It will also automatically play up to six 7in records with large diameter centre holes using a large record spindle, Type LRS 100 available as an optional extra. An adaptor for playing these records singly is provided. Operation is controlled by tabs grouped conveniently at the front of the unit. The tubular arm with its bias compensator calibrated for spherical and elliptical styli, is weight counterbalanced. Stylus force is easily set with the integral calibration. Almost any modern pickup cartridge requiring a stylus force of 1 gramme or more can be fitted to the arm. It can be lowered steadily on to a record using a fluid-damped 'cue and pause' facility, under either manual or automatic control. 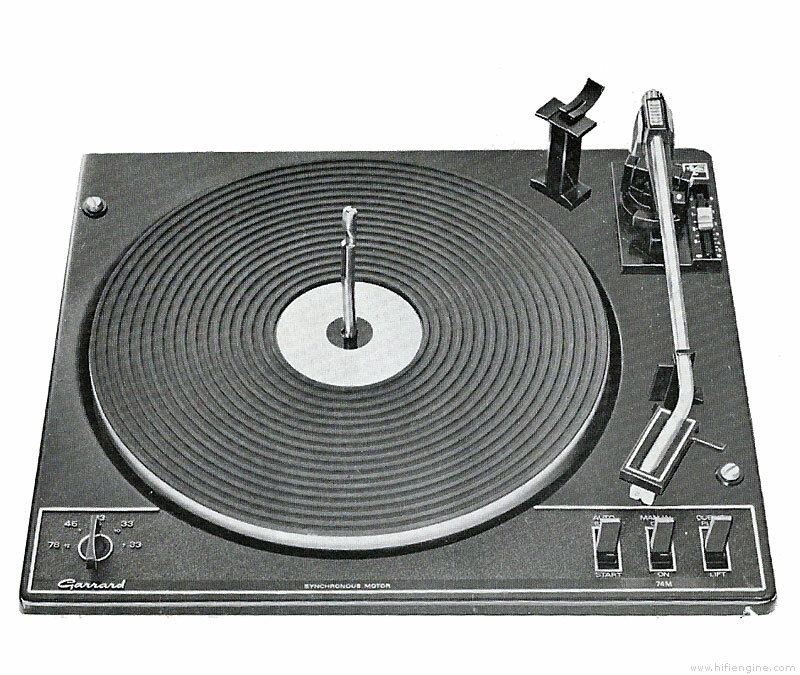 After playing a record the arm will return to its rest and the unit will switch off. Its precision-finished, oil-retaining bearings contribute to smooth running and long life. The rubber mat is designed to be cleaned easily. The Garrard 4-pole Synchro-Lab motor is resiliently suspended. It drives the turntable at a steady speed through a rubber intermediate wheel which is protected by being retracted when not in use. Garrard 74M / 74M owners manual, service manuals and schematics are for reference only and the Vinyl Engine bears no responsibility for errors or other inaccuracies. The PDF files are provided under strict licence. Reproduction without prior permission or for financial gain is strictly prohibited. This website is not affiliated with or sponsored by Garrard.